"I remember the day. It was the day my father spoke more than three words in my general direction." The Revolutionary War/colonial period is one of the most fascinating periods in American history, if for nothing else for the fact that there would be no America if not for that era. There have been countless takes on the events of the era, with most focused on the more "important" areas such as Boston, Philadelphia and New York. What about the wilds of New Hampshire? That's where Rebels #1 from Dark Horse Comics turns its attention. The issue is written by Brian Wood, illustrated by Andrea Mutti, colored by Jordie Bellaire and lettered by Jared K. Fletcher. Wood captures the spirit of that rebellion quite elegantly--albeit somewhat understated--in Rebels #1. Seth Abbott is the voice of the revolution in New Hampshire, contending with a father who really only cared about him as a soldier and a friend in Ezekiel Learned who wasn't always a friend. Wood infuses the book with Seth's narration as appropriate, helping guide the reader through the rather "delicate" interactions that come with fighting the British. 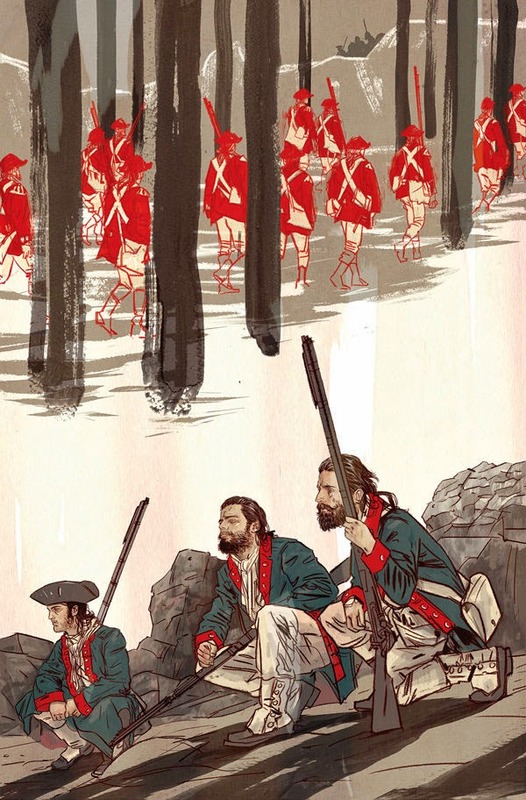 1775 was the year the war started and Wood inserts an appropriate level of tension in Rebels #1 for the characters, as the colonists can sense something brewing. Wood presents Seth with a demeanor throughout the book feels oddly calm, which sort of takes away some of the gravitas of the event, but the setting is New Hampshire, so the seclusion feels appropriate. Capturing the feel of the era is Mutti's pencils, all of which showcase colonists and Redcoats with an emphasis on leanness. Her work gets even more impressive when you take in her pretty breathtaking renderings of an unsettled New Hampshire. New England thrives on a sense of isolation in some points and Mutti's depiction of vast forests is really impressive. Bellaire does an equally impressive job in filling in those forests with lush greens, as well as ensuring that the Redcoats are easily distinguishable from the colonists. Part of the divisiveness in the war was represented in the solid appearance of the British versus the ragtag composure of the American militia and it's something captured beautifully by both Mutti and Bellaire. Rebels #1 takes a look at a front of the Revolutionary War that doesn't necessarily get as much attention as other areas historically. The attention to the New Hampshire frontier is a welcome change of pace in looking at the era, with characters playing as large a role as some of the other more famous figures from the events. Wood's approach is subtle but charged with a lot of subtext, underscoring the rebellious nature of the colonists who just want the ability to manage the land they own. Mutti captures the spirit of the revolution with her sharp visuals and presentation of a world that seems so far away. Rebels #1 offers a look at the fringes of the Revolutionary War, where the stakes are slightly different but the stakes are just as high. Rebels #1 is in stores April 8.